Keeping libraries opened in this day and age seems like it could be a full time job unto itself. Unfortunately, most librarians already have a job, keeping those same libraries running and giving their communities the invaluable support they are uniquely equipped to offer. So, in their spare time, how do they organize events to help fund and support their libraries, how do they rally volunteers, how do they bring community and media attention to their cause? Well, take it from some people who have done exactly those things and successfully saved libraries from having to close their doors permanently with swift thinking, sharp strategies and loud voices. 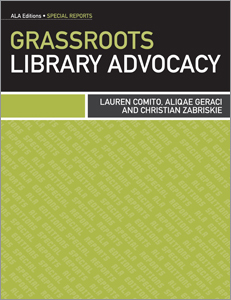 Grassroots Library Advocacy by Christian Zabriskie, Lauren Comito and Alliqae Geraci is the most valuable resource you could possibly have on this subject, especially if you're working with severely limited resources, which, at this point, is practically every library in the country. Learn more right here. Then get out there and save a library or two.